"I love Oprah and loved reading her biography. Her life story is exciting and inspiring and should be shared and read by people who wish to succeed against all odds. Oprah Gail Winfrey was born in 1954. She is an Emmy Ward winning talk show host and magazine publisher. In 2003 Forbes magazine proclaimed her the first black woman billionaire in the world. She has appeared on Time magazine's 100 most influential people list more frequently than any other woman, and considered by many to be the most influential woman in the world. Oprah is one of America's greatest philanthropists donating generously to charity. Not only is Oprah's personal charity giving unmatched by any other show business celebrity, but she has one of the most generous audiences in show business, raising money for various causes. Oprah was on the first national broadcast of "The Oprah Winfrey Show" in 1986. In the mid-1990s the shows adopted a more serious format; addressing issues that Winfrey thought were of importance to women, such as infidelity, child abuse and cosmetic surgery. She often interviews celebrities on issues that directly involve them in some way, such as cancer, charity work, or substance abuse. In addition, she interviews ordinary people who have done extraordinary things or been involved in important current issues. In 1985, Winfrey co-starred in Steven Spielberg's epic adaptation of Alice Walker's award-winning novel "The Color Purple". She earned immediate acclaim as Sofia, the distraught housewife. The following year Winfrey was nominated for an Academy Award for Best Supporting Actress, but she lost. She has also acted in other films. Winfrey publishes two magazines and she has co-authored five books. Winfrey has never married, but it is widely assumed that she has lived with her partner Stedman Graham for almost twenty years. The relationship of Oprah and Stedman has been documented through the years with numerous romantic tabloid articles often accompanied by color spreads of the couple at home and on lavish vacations." 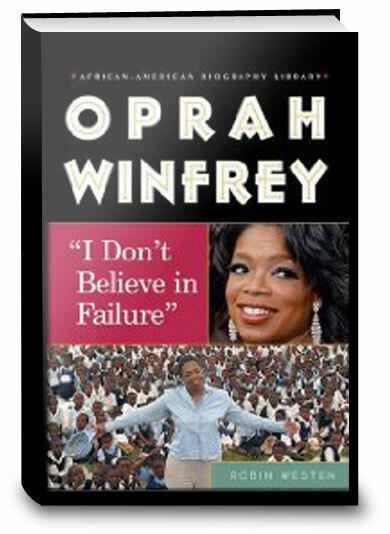 Click the button below to add the Oprah Winfrey: I Don't Believe in Failure to your wish list.